Winger Josh Mansour is really struggling with a persistent injury to his shoulder, which is heavily strapped before every game he plays. The 28-year-old has been in the wars in recent seasons, with knee, facial and shoulder problems, and it’s certainly having an impact on the fan favourite getting to 100 per cent fitness. The club’s medical staff continues to monitor Sauce’s injury, and is hopeful it can be managed through the season. It’s understood the NRL has knocked back disgraced Wests Tigers player Tim Simona’s bid for an NRL redemption story. The former Samoan representative was banned back in 2017 after it was discovered he had been placing minor bets on games, and selling signed jerseys for auction but taking the proceeds himself. Simona has turned his life around and is desperate to play rugby league again, and the saviour of his career could have been the Panthers. Simona’s management had been in regular contact with Penrith about a comeback path, but it appears the NRL Integrity Unit will block that chance. Frank Winterstein’s strong start to the season at the Panthers has suffered a major blow with the 32-year-old set to miss up to six weeks after suffering an MCL tear in his right knee. Tooheys have backed Panthers prop Reagan Campbell-Gillard to be playing for New South Wales in this year’s Origin series. I’m told the go-ahead has been given for a specially designed RCG Tooheys New can, which will be released to coincide with this year’s series. The Tooheys marketing team will be hoping Brad Fittler gives the Rooty Hill Dragons junior a sky blue jersey in June, otherwise there could be a few red faces. Spotted: Panthers General Manager Phil Gould and recruitment king Jim Jones enjoying a quiet lunch at the Happy Inn on Monday. Spotted: New Wests Tigers Chairman Barry O’Farrell in the Chairman’s Lounge at Panthers Stadium last Friday night. Isaah Yeo has escaped suspension despite being cited by the NRL’s Match Review Committee over an incident involving Luke Garner in the second half of last Friday night’s game against the Tigers. Yeo took an early guilty plea to the Grade 1 Dangerous Contact charge, meaning he is free to play this weekend. Spotted: Panthers Chairman Dave O’Neill and General Manager Phil Gould – who according to some sections of the media, are involved in a bitter feud – laughing and chatting at the Squires Bar pre-game last Friday. The pair were also spotted talking in the sheds after the dramatic golden point win. Not a bitter word in sight. Did you know that one of the Pantherettes also appears on ‘Gogglebox’? Vestal Delpechitra and her family have appeared on the popular Foxtel / Channel 10 show since its first season. Spotted: Panthers General Manager Phil Gould in the sheds at half-time last Friday night, watching on as coach Ivan Cleary addressed the team. A few have suggested this was a pure PR move – designed to show some unity amongst the head honchos at Penrith. The Panthers could play three games at BankWest Stadium in Parramatta next year – all of them away matches. Parramatta and the Bulldogs would play home games against Penrith at the new venue, but it’s expected that the Sydney Roosters will take their home game against Penrith, should one be scheduled, out west as well. 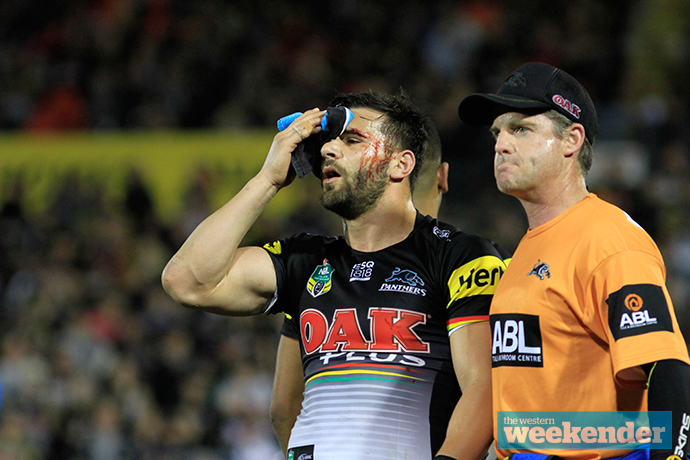 The Panthers are also being urged to take a home match to BankWest in future seasons. Spotted: Recently re-elected Penrith MP Stuart Ayres in the sheds after last Friday night’s game at Panthers Stadium. Spotted a Panthers player or official out and about? Heard some gossip? Tell me: maskedpanther@westernweekender.com.au.